Hello and welcome - it's lovely to have your company for a while here at Words and Pictures. What a weekend it's been! Once a week, between now and the 17th December, Linda is offering up an inspirational tag from which you can leap off in any direction you like. You can play the challenges in any order, at any time you like up until the deadline - Tag 2 has already appeared, but I'm on catch up with week 1 for now. This is the glorious tag Linda created to start us off. I did mention she's a genius, didn't I?! If you've never visited her blog, The Funkie Junkie, or the Frilly and Funkie challenge blog - go now! Some of what I've chosen to play with, inspired by Linda's tag, is pretty obvious, as are some of the changes. I love the pinky-browns of hers, but whenever I do pink, it seems to go all girly - not what I like at all, so in the interests of staying happy I swung to my favourite blues! I loved the embossed stars, so I decided I would have some embossed embellishments, and although the heart with wings is a popular motif in Craftyblogland, I'd never played with one - so I decided it was time to break that duck. I also wanted to include some of the lovely baroque flourishes in the background, but went about it slightly differently. And the general levels of sparkle are not in my usual style - but I decided to give them a go! The one thing I was unequivocally pleased with in my Romeo and Juliet journal pages was the background, so I decided to play in a similar way on this tag. I collaged text and music onto the tag, and then wrinkled tissue paper into the spaces between. The whole thing then got a coat of gesso to tie it all together. As I said, I wanted to use some flourishes to echo Linda's lovely glittery ones - but I decided to dry-emboss mine using the Tim Holtz Texture Trades flourish from the French Connection trio of baby embossing folders. I love that the text is still so present within the texture of the embossing - text and texture... what more could a girl want?! I rubbed Rock Candy Stickles into the raised landscapes of the tissue paper, and then brushed on some Perfect Pearls mica powder - I love the lustre of this... it gleams with a kind of other-worldly beauty. I love how it looks at this stage. I'm definitely going to do this again and stick to the white palette at some point, but it was just a little too ethereal for me in today's mood. I am so happy that the mica gleam survived being blended over with the Chipped Sapphire DI. And the flourishes got a fingertip-full of Frayed Burlap Distress Stickles each, for extra glamour. The hearts are made out of Grungeboard (Tim Holtz), as I knew I'd be hitting them with lots of paints, inks and textures. They're cut with a Sizzix die, and then embossed with the Music Notes Texture Fade folder (Tim Holtz - need you ask?). I started with a coat of white acrylic, then built up via Pumice Stone to Chipped Sapphire DI. Finally they got heat-embossed with some StarDust embossing powder my sister-in-law passed on to me. I don't have any wings in my stash, but one of the other folders in the French Connection trio is a wing, so I embossed that onto some Grungeboard twice, and cut them out. And I am still very wrapped up in A Tender Thing, the Romeo and Juliet adaptation I've been talking about. In fact I'm back to Stratford upon Avon tomorrow to see it through to Press Night. So what with the wings and all the sparkling going on... this quote became inevitable! I had great fun colouring some of the seam binding with Chipped Sapphire and Dusty Concord and then fraying the ends - romantically shabby chic, and very pleasing to me! So from the vulnerable and raw state I found myself in, this weekend of crafting time has restored me to a sense of calm and well-being. It started with working through some of the turmoil in the journal pages; took a huge step in a very good direction reading your comments, and hearing the positivity of your support, for which I was very thankful; and that led to the 'postcard of gratitude', which gave me such joy in the making... and now I'm even prepared to look on the bright (and sparkling) side of love, with one of the strongest statements about the power of love you could find. Therefore, thy kinsmen are no stop to me. That Craft Place Challenge would like us to Make Your Own Background - done! And finally, I'd like to share my lightened heart with Hels Sheridan and her Sunday Stamper challenge Happy Heart. As the last paragraph of the post says, being able to craft in itself is what has made my heart happy this weekend. Well, after having put us all through the wringer with the previous post, I wanted to lighten the mood a little, so this postcard comes WITH LOVE to my crafty friends and followers, old and new. Your generous support and positivity here in Craftyblogland adds a whole extra dimension of joy to this new and obsessive hobby of mine. Regular followers will spot old favourites here... a return to the comfortable, familiar and happy after the tricky traumas of the journal pages. And, what do you know, principal colour combination? Well, that would be browns and blues, Chipped Sapphire, Vintage Photo, Brushed Corduroy, some Coffee Archival - with a little Dusty Concord thrown in for good measure! I had great fun with the letters, from the Tim Holtz Alpha Parts set. They come in black plastic, so I gave them a coat of acrylic, then dripped Mushroom and Denim alcohol inks onto them - so cool how it spreads along the stems and curves! Then, finally, a spritz of Perfect Pearls Mist in Pearl, heat dried on. I love the enamelled gleam it gives to the letters... if you catch them in one light you can see the metallic mica powders, if you turn them a little, you get a gorgeous glossiness. The edges of the 6x4 postcard are distressed with the Tim Holtz Paper Distresser, and most of the stamps are his too... barring my much-loved (and oft-used) Stampology Silhouette Blossom around the edges. It's quite roughly applied with the tip of my finger - though not quite as roughly as this photo seems to imply... I promise there's some on the top of his head too! So, once more, my grateful thanks for your company on this journey, for your wonderful uplifting comments and feedback, and looking forward to many more exchanges of visits and inspiration in Craftyblogland - this comes with love, and good wishes for a happy Sunday, wherever you are in the real world. Gratitude is the music of the heart, when its chords are swept by the breeze of kindness. Hello all, and welcome to Words and Pictures - I'm very happy you were able to find time to stop by - though I have to admit I'm not sure about today's journal pages. There was a point where I was really happy with where they were headed, and then sort of lost my way... partly because it mattered too much, so I lost the ability to make playful decisions (if you know what I mean). But the impulse to create these pages came from less-than-comfortable place, so maybe it's right that the pages feel less than comfortable. Maybe raw emotion doesn't make for easy crafting! Anyway, see what you think... (probably worth clicking for close-ups if your browser lets you - this was tricky to photograph). The whole thing was kicked off by a show I'm working on at the moment for the RSC, called A Tender Thing. It's a wonderful mosaic of Romeo and Juliet reworked as a piece for two older actors, an elderly Romeo and Juliet facing losing each other at the end of their long and loving marriage. In the end, it's uplifting rather than depressing because essentially it is about the thing Shakespeare always writes about: the extraordinary capacity of the human spirit to endure, and to love. But I've been sitting in a theatre with it non-stop for a week, and have been left feeling rather raw. At one point there's a sequence tracing Juliet's deterioration, and the burden placed on Romeo, with a glorious version of Gershwin's The Man I Love, a 1928 recording of Sophie Tucker, as the underscore. It's wonderful - have a listen, if you like. And it's been haunting me... it's a song I've always loved, with words that strike a resounding chord for me (cos he ain't got here yet...), so that's the text which arrived on the pages here. The rest of the lyrics are at the foot of the post. The background is full of music and text (as the show is), and full of glimmering textures - Rock Candy Stickles and Pearl Perfect Pearls mica powder rubbed in with my fingers to the places where I'd glued wrinkled tissue paper. 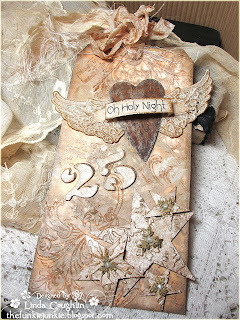 I used stamps by Tattered Angels and by Tim Holtz to add to the sense of structures decaying, cobwebbed and weathered (still haunted a little by Miss Havisham too, perhaps!). The stamping and inking is all done in Pumice Stone DI - I'm in love with its subtle depth of gray. But at the core of the play, and also at my core just now, there is a sense of dislocation and discomfort - so I wanted to disrupt the beautiful background and confident sentiment with the jarring of things going wrong. Having written the lyrics using my black fountain pen (girding my loins to let my own writing onto the page, as I know one really ought for art journalling), I then shook the pen to splatter blots of ink across the piece. I also added some stamped blots and blotches using part of an Indigoblu set called Yorkshire Evening Post. The clock is part of the waiting for "some day" to come along. I cut it ages ago using the TH Weathered Clock die and some textured kraft packing paper. It's slightly inked and gesso'd, as was the heart (handcut from some other corrugated kraft packing card); but the heart then also got a good spritz of Perfect Pearls Mist in Pearl, for that watery shimmer. I'm very wary of the handwriting, and once the blots were there I felt the background faded too far into the background - if you see what I mean! Edging the pages with some Black Soot DI added some definition which brought it back into focus - but it was really tricky to photograph as the black seems to be what the camera prefers to pick up on. Over all, it does feel as though it's reached somewhere meaningful, so I'm going to let it sit for a while, and see how I feel about it in a few days. I'd love to know what you think in the meantime, so do leave a comment if you feel so inclined. Juliet: Come night, come Romeo, come thou day in night! Romeo: What lady's that?... Oh, she doth teach the torches to burn bright! Juliet: More light and light it grows. Romeo: More light and light, more dark and dark our woes. Update: I know lots of you have been enjoying the song - there's always a lovely musical treat available at a favourite blog of mine... eclectic meandering. The thoughts and the musical interludes are indeed eclectic - and often wonderful and unusual finds! Hello all! I'm so happy you've found the time to stop by - and an especially big welcome to the new followers... it's wonderful to have your company! I've been so enjoying playing with the Artistic Outpost Steampunk stamps - the images delight me. I did warn you, if you saw this piece, that you'd be seeing more of them soon. And when I bumped into a couple of Childhood and literature challenges on my travels, it kindled a fresh spark of inspiration - my mind went straight to Edith Nesbit's The Railway Children. It's a small collaged wall hanging inspired by a combination of the stamps and the book and, to be honest, the film of the book too - which is part of my childhood as much as the book is. When I first got the stamp set, I stamped the images quite simply in archival black on some smooth cardstock - just trying them out. But then they were sitting there on one corner of my table, begging to be used... so here they are. They are inked with Vintage Photo (what else?! ), creased and torn up a little, and the edges ribbed with the Tim Holtz Paper Distresser. I then gave them both a coat of Rock Candy Crackle Paint, and left them to get on with crackling. In the meantime, I got on with creating a background. I decided to use some thick watercolour paper, and set to work with some of my favourite DIs (you can see them all lying around here). I put smears of Vintage Photo, Stormy Sky, Frayed Burlap etc etc straight on to the craft mat, gave them a good spritz of water and played with the lovely TH wrinkle free distress technique, building up the layers of colour. Once dry, I also blended some inks on with a blending tool. And there's an edging of Vintage Photo Distress Embossing Powder to frame it. You'll see in one corner a ghostly image of the butterfly girl. I sort of liked it, but she wasn't quite present enough, so I changed the plan, and added another touch of 'book-ness' to the piece by stamping both her and her "father" (another stamp from the AO set) onto pages torn from an old book. (I have to own up: I'm afraid it's not a copy of The Railway Children, but rather some pages left over from this alteration of Great Expectations - sorry!) If you look closely, you'll see her hair ribbon is part of the background - accident or deliberate positioning - you decide!! The sentiment, stamped and crackle-glazed into one of the Funkie Junkie's lovely rusted bottle tops, comes straight from one of the most tear-jerking scenes... and I'm afraid here is where it's definitely the film rather than the book that I'm remembering from childhood. And, with my Words hat on, I think it's a perfect line... it wouldn't be nearly so effective if she just said "Daddy, Daddy!" - I believe it's in the sigh of the ay sound in the "my" in between the Daddys that all the emotion really lives. It's surrounded with TH Idea-ology gears, and there's another rusty Funkie Junkie piece in the form of the heart up by the father's face. It's my first use of the eyelets and eyelet tool I got for an absolute pittance in the Czech Republic over the summer, and I've used some dark brown leather thong to hang it. The same leather is used to adorn the lace at the foot of the piece - more CZ shopping, inked with Antique Linen and Vintage Photo to soften its rather luminous whiteness! The two little tickets could either be platform tickets - which you used to have to buy if you wanted to go onto the station platform just to see somebody off on the train, or perhaps they're cinema tickets to go and see a Saturday morning showing of The Railway Children in the 1970s. And then the pen nibs are there to take us back to the written form of the story - back to Children's Literature... By the way, I do know that my butterfly girl is really too young for the role, but there's something so right in her expression of expectation, that for me fits perfectly with that haunting cry, "Daddy, my Daddy!". So glad you found the time to drop by (especially if you've done it twice... second post today! ), and I look forward to repaying the visit as soon as I have the chance. In the meantime, enjoy doing whatever it is you enjoy doing! "Apple pie for breakfast - we can't be poor after all!" The Craftroom Challenge want our Childhood Memories - this is very much one of mine, but I'd like to add that I didn't see it when it came out in 1970 - but a few years after that! Hello all... later than usual this week with What's On Your Workdesk Wednesday, sorry! And the picture was actually taken at 7am on Monday, before I left home (working away at present), so it's really a photo of What's On My Workdesk Monday, though I can promise you that it's all still there today, as nobody will have touched it in the meantime!! Lots of DIs in my favourite blues and browns; some half finished tags; some leaf die-cut leftovers in gold (from this), waiting to be used as templates in future projects; a timeworn rusted key; and the hanging I've been working on, which will be posted shortly - if I get it all done in the lunch break now! Done now - here it is. If all the WOYWWWOMWM is confusing you, pop over to Julia Dunnit's Stamping Ground for the hop of the week around the craft desks of the world... and it will all become clearer! Once again, I'll have to be doing my visiting over the course of the coming week, but I'm looking forward to coming for a good snoop very soon. In the meantime, a happy WOYWW to you all! Hello all, happy Sunday to you! Thanks so much for stopping by today... especially if you've done it twice - this is the second post of the day (the other's here)! I've a triptych to share with you this time, inspired by the wonderful Artistic Outpost SteamPunk stamp set, with the emphasis on the Steam! For work, I sometimes live in Stratford upon Avon and every Sunday during the summer, a traditional steam train sets off from the station there for enthusiasts to take a ride into the steamy mists of nostalgia. I've been down to see it depart a couple of times (including taking my young niece and nephew), but even from my tiny little courtyard garden, I could always hear it chuff chuffing away, and then the oh-so-evocative whistle as it picked up speed. It's one of the most romantic sounds, the sound of escape and travelling; the American train whistle does it too, calling you to vast landscapes and wider horizons. So this is a triptych tribute to the "Golden Age of Steam". On the front you get a traditional vintage scene, and on the back a much more fragmented, abstract view of the steam locomotives, with tissue tape 'train tracks' cutting right through it. The Artistic Outpost stamps are delicious. First I stamped some lovely circles from the Whimsical Melange set onto white paper. Then I did my favourite tissue paper stamping technique with the station and train (twice, so that I could have one going in each direction for symmetricality on the triptych), and stuck them over the circle background, nice and 'wrinklily'! I used a blending tool to add Vintage Photo, Weathered Wood and Stormy Sky DIs. I already knew the sentiment I wanted to add, a snippet of a poem by Hart Crane, so evocative... and (with my Words hat on) I just love those alliterative Ws, so I lined them up over one another to draw the eye, and therefore hopefully liven up the lips as you speak them. To live up to the words of the poem, I added some additional puffs of steam by loading a paintbrush with white acrylic, and just a touch of mushroom paint on one edge. The tops of the panels are cut using the Brackets On the Edge Die, and the gears are TH Idea-ology ones. I wanted them to echo the circles hovering in the ghostly background under the tissue paper, but with an even more engineering-y, industrial look. On the reverse of the triptych I collaged torn pages from an old children's encyclopedia (another casualty from the massive house clearing that's going on in preparation for leaving the family home of 40 years). There was a double page spread illustration of a steam locomotive, so I made that my central image but broke it up across the triptych. I stamped some more of the Whimsical circles, quite randomly, added some stencilled polka dots, and inked, all the time echoing the colour blending from the front side from browns at the base to blues at the top. I gave it a little spritz of Heirloom Gold Perfect Pearls Mist to get a vintage lustre. For the hinges, I wanted to create some "train tracks" running across the back of the triptych. I used some Tim Holtz tissue tape, the calendar, which has the straightest lines of the tapes I've got, so making the best train tracks. It also has something of a train timetable feel, as well as marking the years that have passed since the great steam trains ruled those tracks. I stuck the tape to some kraft paper, inked it, and gave it a good spritzing with Perfect Pearls in Pewter and Heirloom Gold. So that's my train track triptych tribute to 'the Iron Horse'... somehow travelling on trains these days just isn't quite the same. I had such fun playing with these glorious stamps... you'll definitely be seeing more of them!! Since I'm in Stratford for most of next week (no steam trains this time of year, sadly), I won't be able to do any crafting (aaagh! ), but I should be able to catch up on some blog visiting. Looking forward to seeing you soon somewhere in Craftyblogland! Nostalgia is like a grammar lesson: you find the present tense, but the past perfect! The only way of catching a train I have ever discovered is to miss the train before.